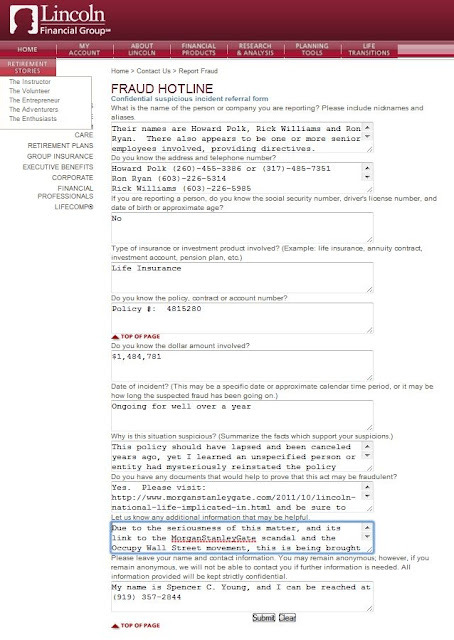 Catch this: Lincoln National Life Insurance Company refuses to divulge who made a premium payment of approximately $100,000 to secretly reinstate a $1.5 million whole life insurance policy on Spencer C. Young's life! Why? Read on. Although Lincoln National Life Insurance Company (hereinafter “Lincoln”) was provided the requisite documentation to release information associated with the $1.5 million insurance policy on the life of Spencer C Young, they continue to withhold this information, and have been unresponsive to requests for its immediate release, as well as requests to cancel this policy. In 2010, an insurance fraud and attempted assassination plot was exposed, and Lincoln has heretofore relied on obviously doctored trust documents to NOT reveal the identity of the person or entity who reinstated this policy in the second quarter of 2010 with a large premium payment covering approximately five years. The insurance fraud and planned assassination are an element of MorganStanleyGate and therefore linked to the Occupy Wall Street movement. 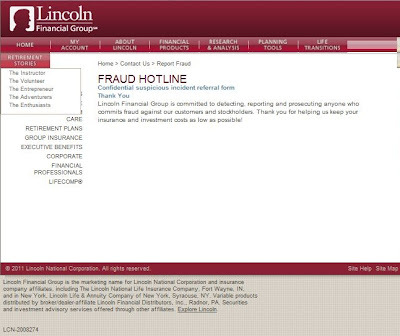 This insubordinate and irregular behavior has been reported to the Lincoln Fraud Division for investigation, as reflected below. As it may be difficult to read, the submitted information is reproduced at the bottom. What is the name of the person or company you are reporting? These are Lincoln Financial Group employees. Their names are Howard Polk, Rick Williams and Ron Ryan. There also appears to be one or more senior employees involved, providing directives. Do you know the address and telephone number? Do you know the policy number? Do you know the dollar amount involved? Why is this situation suspicious? This policy should have lapsed and been canceled years ago, yet I learned an unspecified person or entity had mysteriously reinstated the policy (without my knowledge) by making a large lump sum payment in the second quarter of 2010. And it was at that time an assassination plot on my life was exposed and thwarted. 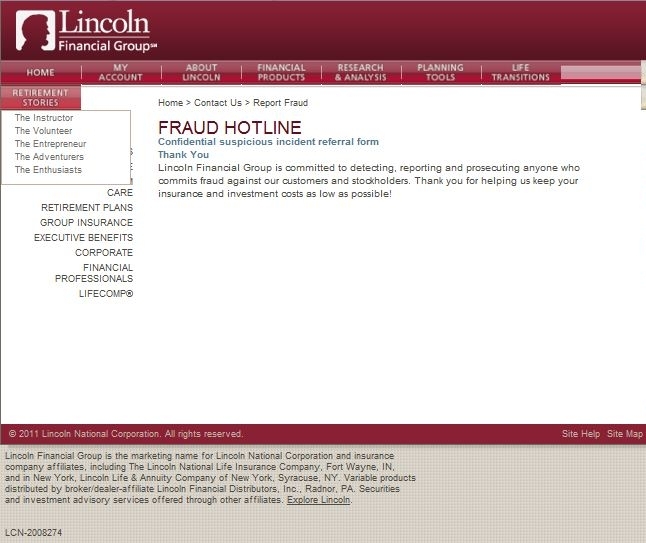 I had reported this to Lincoln Financial as an instance of insurance fraud; however they were oddly non-responsive and they have since refused to release any information on this policy, including the identity of who made the reinstating premium payment(s). Pursuant to the operative trust documents (which were doctored in a manner that oddly prevented me from obtaining information on this policy), I have appointed a new trustee, and that trustee has directed Lincoln Financial to cancel the policy and immediately release all information associated with this policy to me, and Messrs. Polk, Ryan and Williams have been insubordinate and unresponsive to this request. Do you have documents to prove this act is fraudulent? Any additional information that may be helpful?